Having two spectators write down two numbers, choose two cards, lose the cards in the pack and finding their cards at their numbers! Letting someone cut a freely chosen card into the pack and knowing the card's location with just a glance! Allowing a person to freely shuffle a pile of face up and face down cards, give you half the cards without you seeing them, and having your pile match his, despite touching your pile with only one hand for only a few seconds! Losing the four Aces into the pack and finding them by cutting the pack, the last two at the same time! Performing a baffling double location in which the spectators select and bury chosen cards with the deck in their hands and then, as a continuation, producing the four Aces! Permitting three spectators to select and lose cards into a thoroughly shuffled pack in their own hands, and with one run-through of the pack, name the three selections one after the other! All of these miracles, and many more are thoroughly explained by Nick Conticello in the final installment of Sunken Treasury , a five-part meditation on the sunken key card. The CAFE Control - Inspired by Aronson's UnDo Influence, Nick's variation allows two spectators to choose cards freely from shuffled packets, but still control the chosen cards to predetermined locations. This part also includes new work on the popular Shadow Placement. Utility Effects - This part features effects with a shuffled pack which, while strong in themselves, enable the performer to set one or more sunken keys into position for another effect. The final item in this part is a double location with a single sunken key. More on the Radar Principle and Littlecount - Advanced handlings of Conticello's signature concepts, which while risky, permit some truly astounding locations of selected and (occasionally) thought-of cards. One item permits keys to be set merely by cutting the pack a few times. Besides the twenty titled effects, there are numerous variations, and a few surprises. Almost all the material is sleightless, the few exceptions involving nothing more than a Jog Shuffle, a Double Undercut, or a Slip Cut. Conticello's modern treatment of Vernon's Cutting the Aces includes a full description of the Ossip Slip Cut. This installment includes thoughts on presentation, a brief biography of the author, and a list of works consulted. 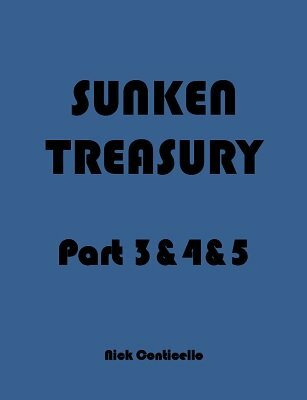 Sunken Treasury Parts 3, 4, and 5 contains a wealth of ideas and information that every serious card enthusiast will want to read and use. 1st edition 2015, 73 pages.